Bechtel as a company works on some of the largest engineering projects in the world, having worked on the Hoover Dam, the Euro tunnel, and the Bay Area Rapid Transit system in San Francisco, it currently employs approximately 50,000 people worldwide. Within the company, a small band of engineers known as the Advanced Simulation and Analysis (ASA) group, operates. One of the projects on which Bechtel and the ASA group are currently working is known as the Hanford Waste Treatment Plant (WTP) project. The current engineering challenge is vast and unheard of at this scale; 211 million liters of radioactive waste- of which the exact composition of the contents is unknown- stored in 177 deteriorating underground tanks is threatening local underground water sources. A vast majority of this waste was produced as a byproduct of Cold war era plutonium production and as with many aspects of the projects, scales were enormous. When the onsite B-reactor went online in 1944, it had gone from the initial design to start of operations in just 13 months, and once operational, its cooling required 280,000l of Columbia River water per minute. At its peak, the Hanford site would operate five such reactors, employ more than 50,000 workers, and cover approximately 1,500 square kilometers. The Hanford site was created in an effort to move plutonium production away from the heavily populated areas outside of Chicago, and to the western deserts in Washington State. Due to the secret nature of the project, many details of the contents of the underground tanks filled with the waste is unknown and the plans and blueprints which were used to construct most of the site, have long been destroyed in order to protect the classification of the site. In most western countries, the method for dealing with such waste is through vitrification. This is a process by which water is removed from the waste, isolating its radioactive components and then adding glass-forming chemicals and solidifying the mixture in a furnace at 1,500°C. 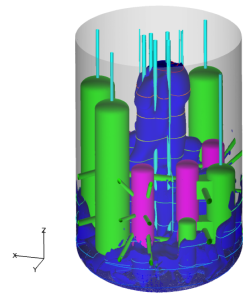 After the cooling of the rod-shaped solidified glass waste, the rods are stored in cylindrical steel containers and can be left for long term storage, a period over which the waste can safely radioactively decay. The vitrification process is vetted and considered to be a safe disposal procedure for radioactive waste. What makes the WTP project such a challenge is the combination of scale, complexity, location, and uncertain nature and composition of the waste that is to be processed. To handle this large and varying amount of radioactive chemical waste, the process has been designed to handle a multitude of compositions, adaptable to what comes out of the underground storage tanks. At present, the proposed process is to draw the waste out of the individual underground tanks and to then separate it into two categories based on the level of radioactivity in the waste- low-level and high-level waste. However, as the waste has had many years to settle and rest, disturbing it could have dangerous side effects, the worst of which would be a critical mass event for many of the dangerous radioactive isotopes that are present in the waste. As such, important steps have been taken prior to processing the waste to ensure that it stays properly mixed. Contour plot of a PJM vessel during a drive phase. For this purpose, once the waste is pumped out of the underground tanks it is kept in a mixed state through the use of pulse jet mixers (PJMs). Due to the large quantity of waste that is to be processed over the forty year operating life of the Hanford WTP plant, the PJMs must be incredibly reliable, ensuring that the waste stays adequately mixed without the ability for any service intervals. The lack of serviceability is due to the fact that once operations commence; the PJMs and all equipment will be irradiated and therefore will no longer be safe for contact during repairs or maintenance. As such, the PJMs must continue to operate without complications; the ability to work on the unit is limited by its radioactive contents. The advantage of using pulse jet mixers is evident in their reliability through a lack of moving parts. Operation consists of a pneumatically driven drive phase and refill phase, the former pushing fluid through the nozzle of a larger cylindrical tube and the latter filling that same tube through the same nozzle. In short, it is analogous to a straw in a glass of water pulling and pushing fluid. The pulling and pushing of said fluid is what maintains the adequate mixture of the radioactive chemical waste as it is being prepared for the smelters that will solidify the waste. Due to the long operating lifetime of the PJMs onsite, there is a high focus placed on the reliability of the systems. 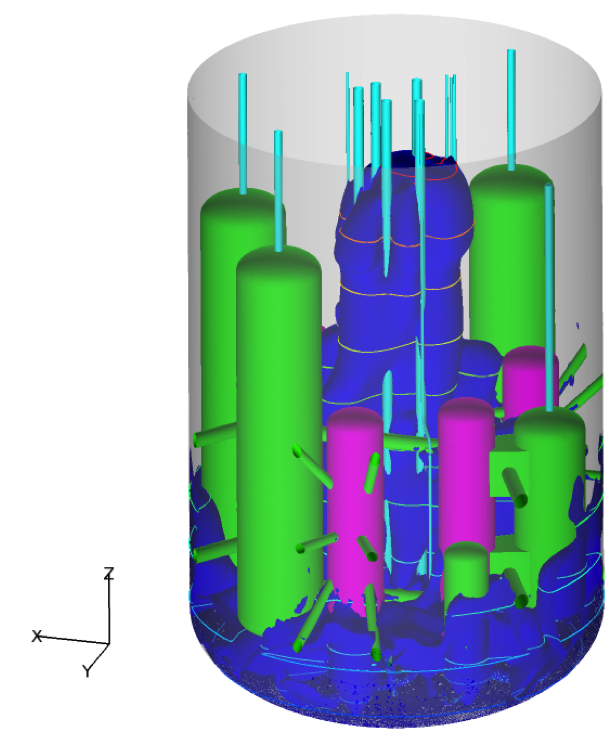 In order to ensure this reliability, the Advanced Simulation and Analysis group within Bechtel is charged with the task of conducting CFD studies on the PJM systems. 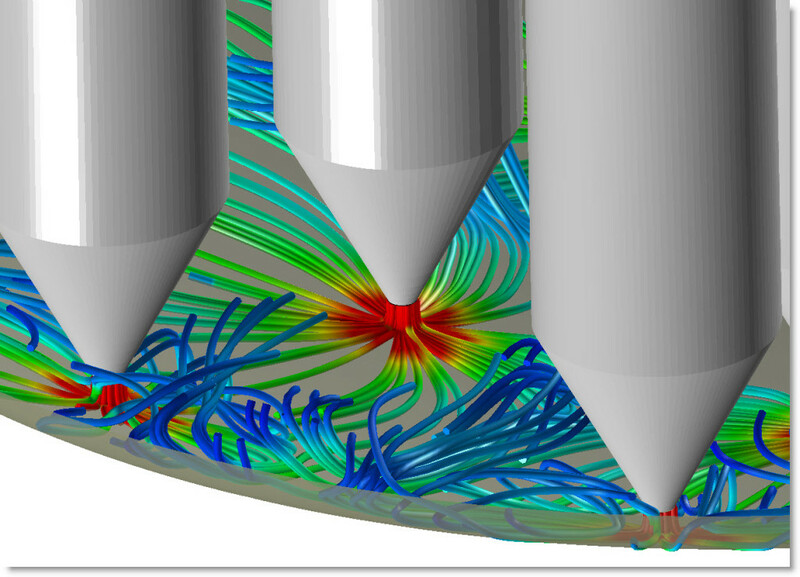 During the internship, the task was to investigate flow characteristics in the UFP-62 PJM vessel. UFP-62 is one of many different vessel configurations at the Hanford WTP site that is capable of handling a waste composition of a certain size. Due to the unknown nature of the contents in the underground tanks, once it is pumped above ground, there are many different vessel configurations that can handle the broad range of possible compositions. 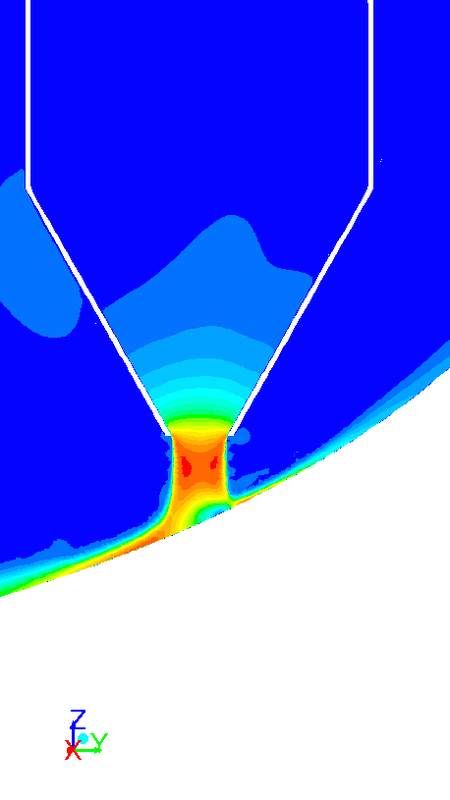 The UFP-62 vessel during drive phase highlighting fluid flow above a certain magnitude. 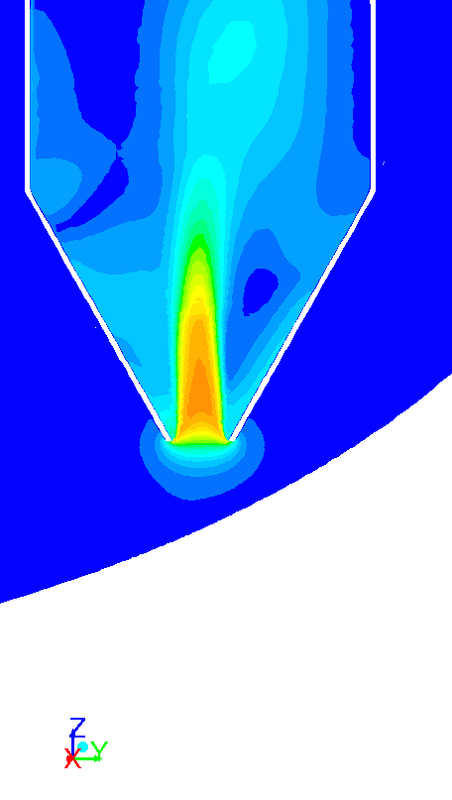 The CFD (Computational Fluid Dynamics) study into the UFP-62 vessel would concentrate on flow near the lower portion of the vessel where many different support structures for the PJMs were in place. Due to the nature of the fluid, the flow, and the characteristic lengths in the UFP-62 vessel, the Reynolds numbers in the tank were investigated for certain flow phenomena that could occur in the fluid over its operating lifetime. Of interest was the possibility for vortices formed by the several of the support struts in place within the vessel. A major part of the internship period was spent ensuring that a high quality mesh was created for the UFP-62 vessel and for this ANSYS ICEM was used to create a very high-resolution mesh upon which a three-cycle, 75 second simulation was conducted using ANSYS FLUENT. Velocity contour plot of the drive phase. The suction phase in the UFP-62 vessel. Many different areas of the tank were studied and a strong connection was made between the theoretical material learned at university and its practical applications in industry. Bechtel and the ASA group along with the U.S. Department of Energy will continue to work on the Hanford WTP project for many years to come. Due to the diverse nature of the project and the sizes of the companies involved, the internship experience helped to shed light on the many different directions one can take their aerospace degree.